Funny. At the end of a long workday, making dinner is anything but relaxing. But on vacation? Ah, that might be another story. If you harbor dreams of swanning around the kitchen of an Italian villa, rolling out fresh pasta, and sipping a glass of local wine, you're not alone. Travel agencies report an uptick in bookings for culinary vacations, and select Starwood and Four Seasons properties are adding cooking schools. 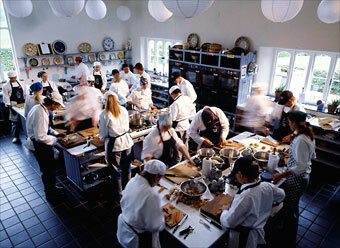 Asian luxury chain Anantara, meanwhile, has seen a threefold increase in demand for culinary classes at its resorts. And why not? As food has turned into entertainment, cooking has become an indulgence, not a chore (okay, the winetastings don't hurt either). Here, a few choices for every palate.